Easily secure lawn mowers, bicycles,Jet Ski’s and other high value items. (Includes cable lock and wall bracket). 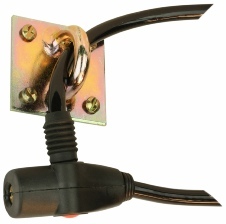 Secure valuables in seconds by passing the 12mm x 1.5m cable through the item and the wall bracket. Can be used to secure a Jet Ski to trailer by threading through mooring eye and wrapping around trailer chasis.